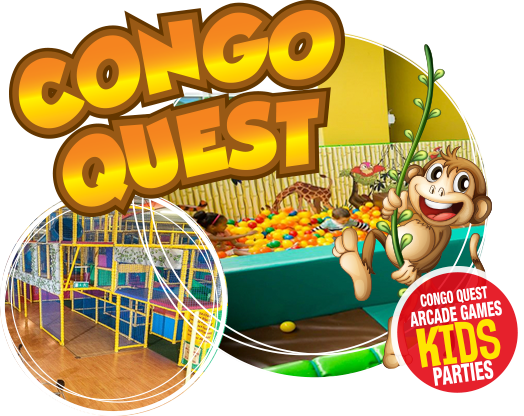 Congo Quest is 8,000 square feet of a 3D jungle life like experience. Kids can explore and roam about our play frame as they go on their adventure under the supervision of their parents/guardians. 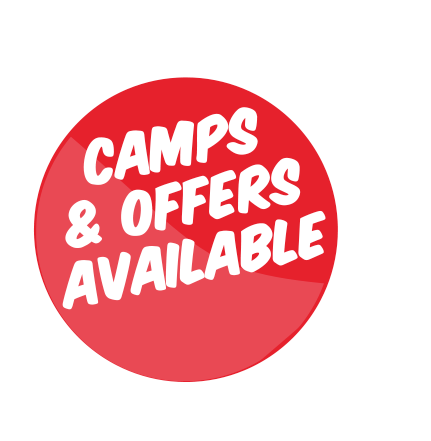 Facilities include Ball Pools, Crawl Tubes & Slides, Soccer Court and a Soft Play Area! While the little ones play, enjoy a coffee and a light snack in the Congo Café upstairs. Complimentary WiFi is also available while you wait. 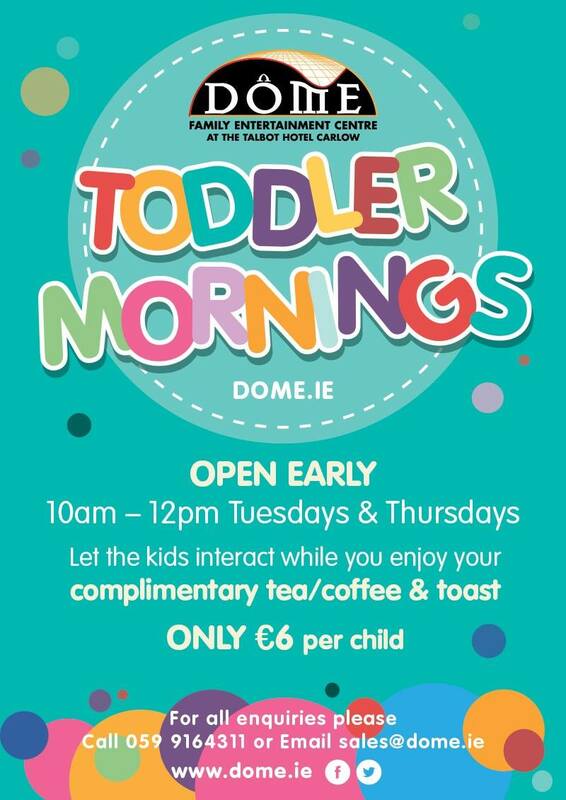 Under 5’s are €6 for unlimited play time. 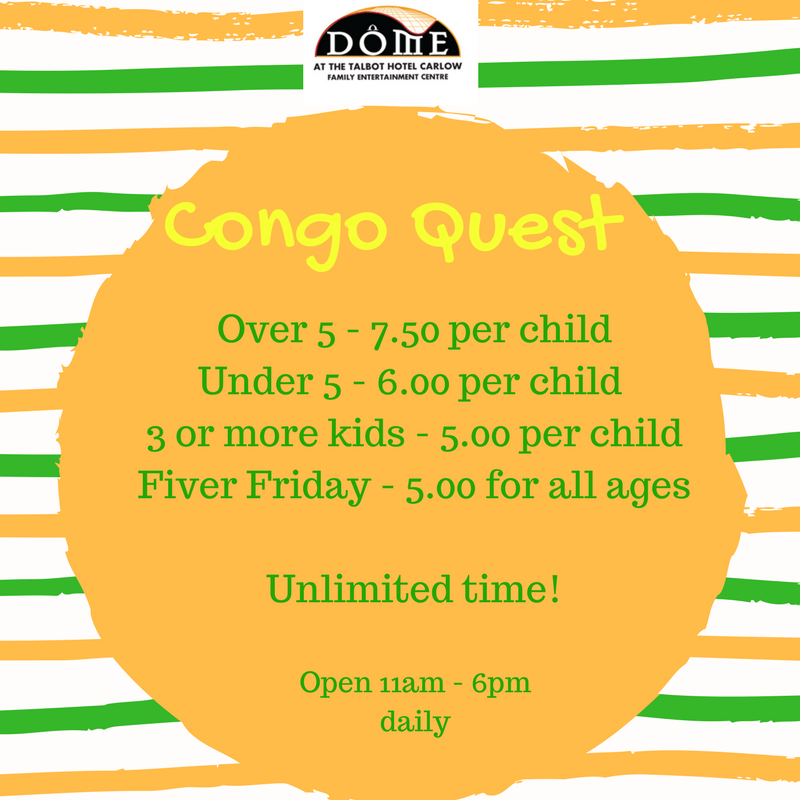 Over 5’s are €7.50 for unlimited play time. 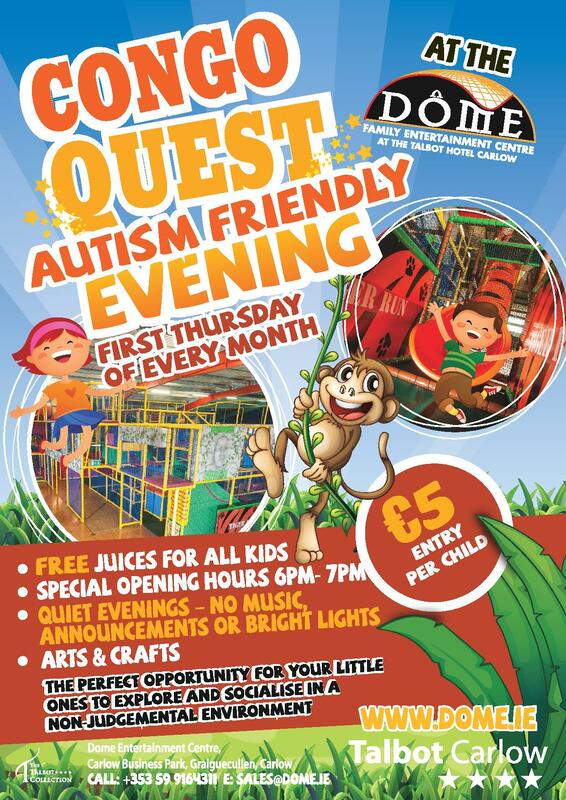 €5 per child if there are 3 or more kids for unlimited play time. 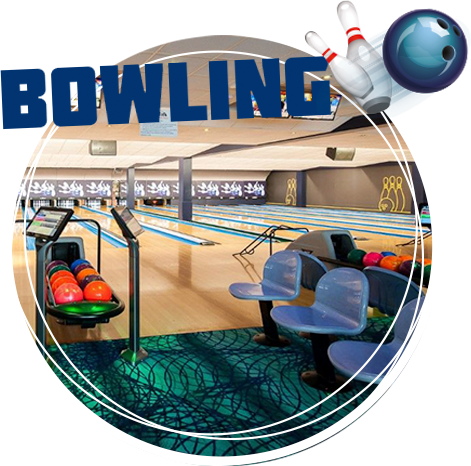 Our Pins on Strings Interactive Bowling is the only Pins On Strings in theSouth East and is the next generation of bowling. Interactive bowling withtouch screen monitors that are fun for all ages. Take a Selfie or post on Facebook through our interactive monitors. So much more than just bowling! 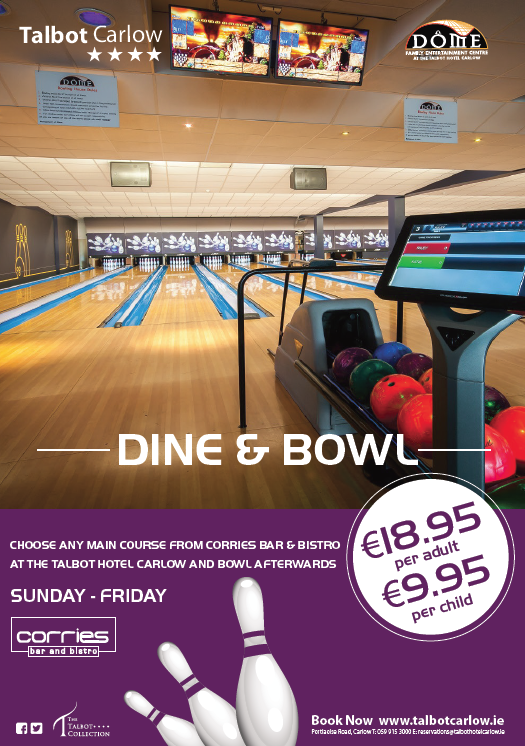 A 10 Pin Bowling Alley that can be enjoyed by all ages and is ideal for a range of occasions! 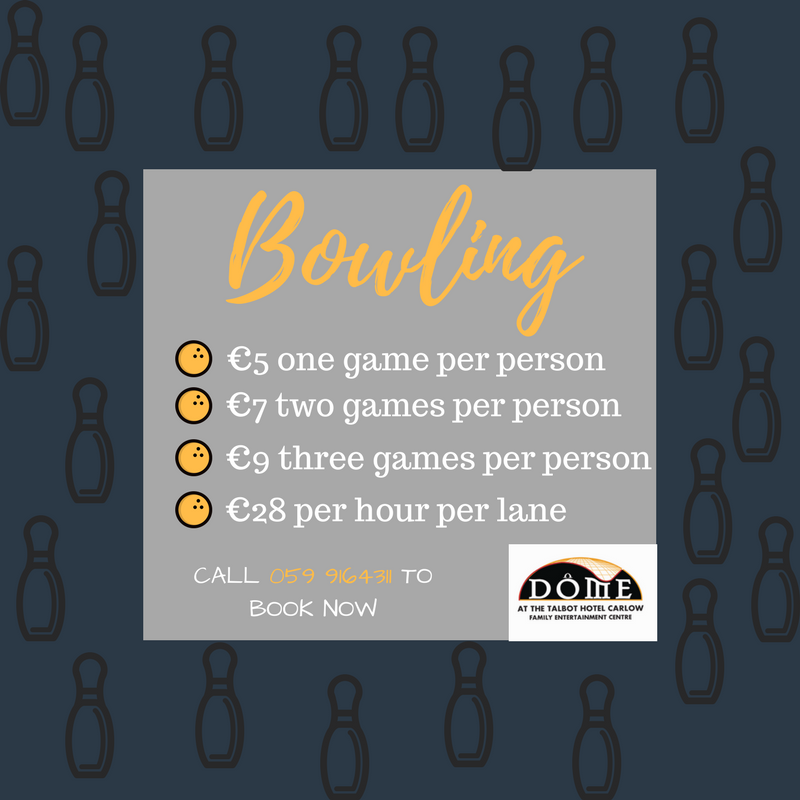 All lanes are fully accessible to wheelchair users and are fitted with side bumpers so bowlers of all levels can strike out! Struggling to think of ideas for a romantic date night? Family activity that you can all enjoy – even Mam and Dad? We’ve got you covered with Dine & Bowl! 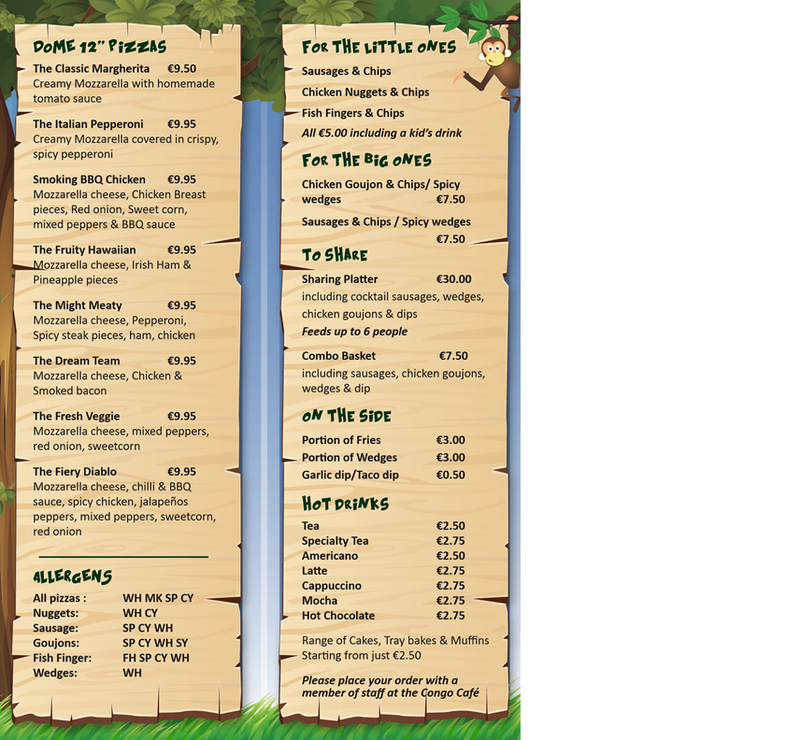 Choose any main course from Corries Bar & Bistro at the Talbot Hotel Carlow and Bowl Afterwards. 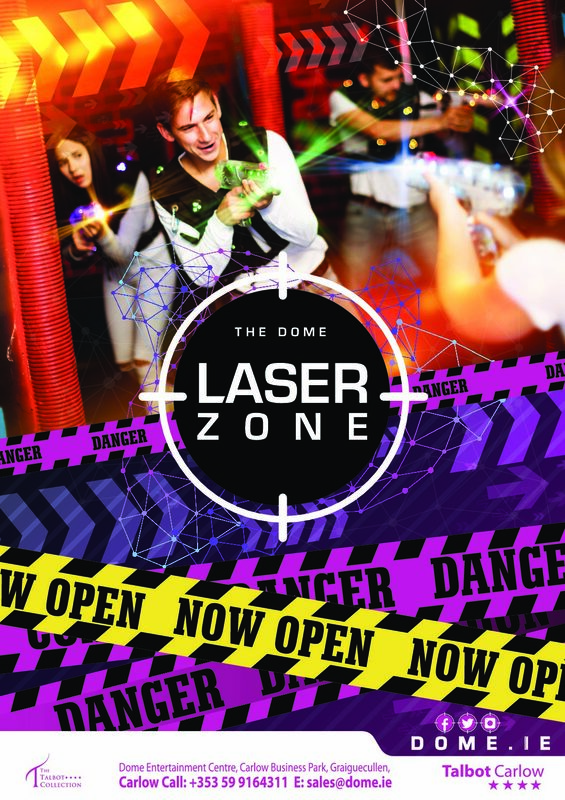 Our brand new state of the art Laser Zone is uniquely designed for The DOME. Our laser tag arena is fun for ages 7 to 70! Test your skills and abilities in our space themed arena.  Each player, whether individually or on teams, use their phaser to tag their opponent and score as many points as possible. No need for heavy vests and equipment, your opponent’s phaser is your target! 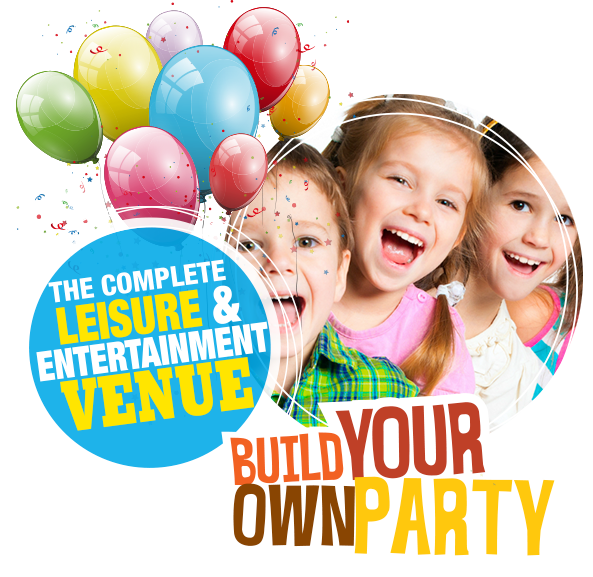 Perfect for all occasions – birthdays, school tours, corporate nights, family fun and more! 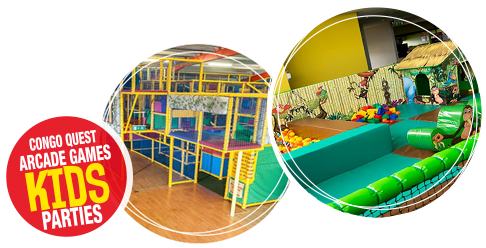 With three themed party rooms, the DOME Family Entertainment Centre is also the ideal venue to host kids birthday parties with a difference. We guarantee HOURS of entertainment! 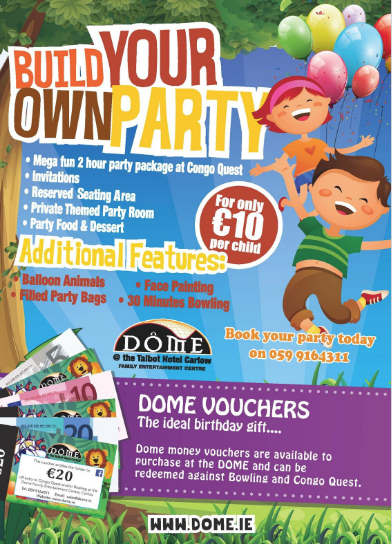 Plan your little one’s birthday party at the DOME today. Let us look after everything! All of the above for €10 per child. Minimum of 6 kids for all birthday parties. 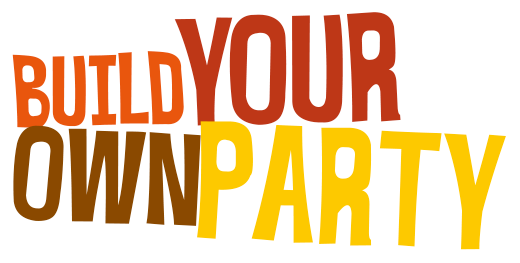 A €50 deposit is required a week prior to the party to confirm date and time. 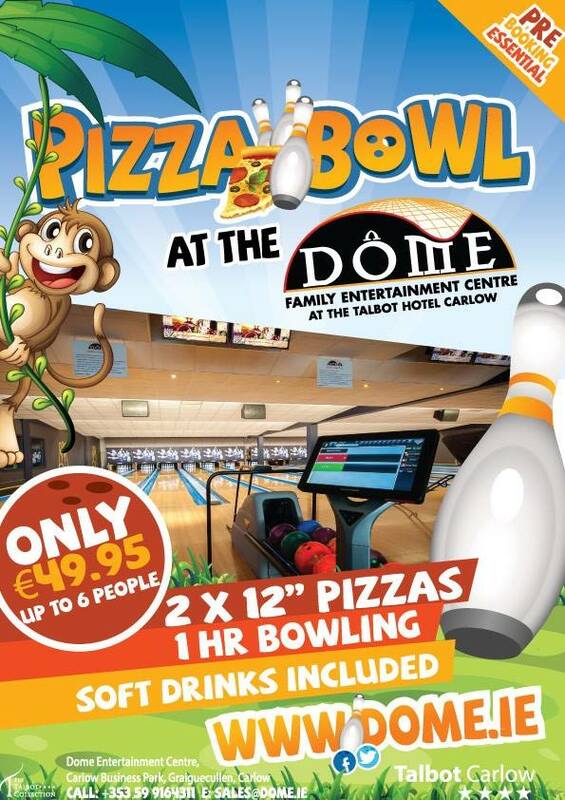 DOME vouchers are now available to purchase at the DOME Family Entertainment Centre. 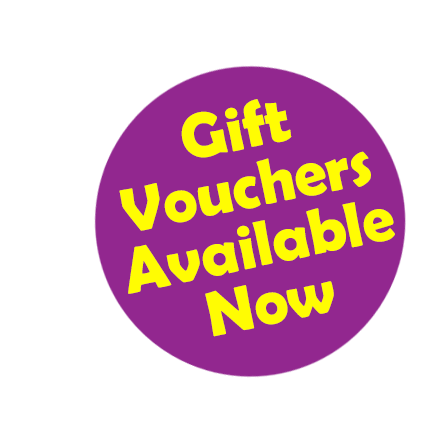 They make a great gift for Christmas, Birthdays, Communions and Confirmations. 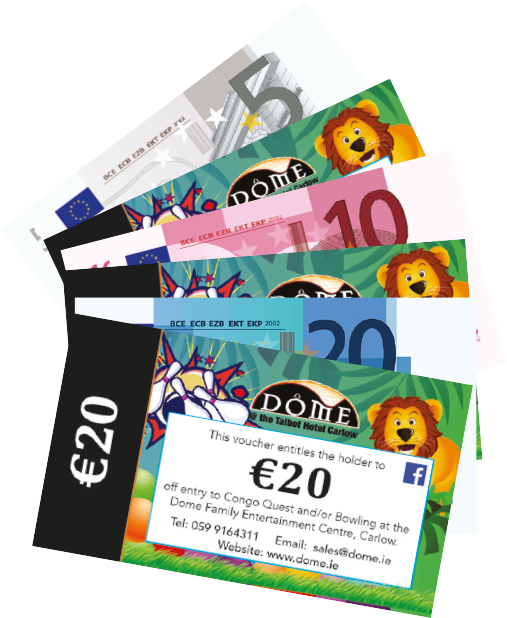 Available in amounts of €5, €10 and €20, they can be redeemed against Congo Quest or Pins on Strings Bowling.  Pop into the DOME today to purchase your DOME vouchers. *Christmas Opening Hours – The DOME is closed on 24th, 25th & 26th December. 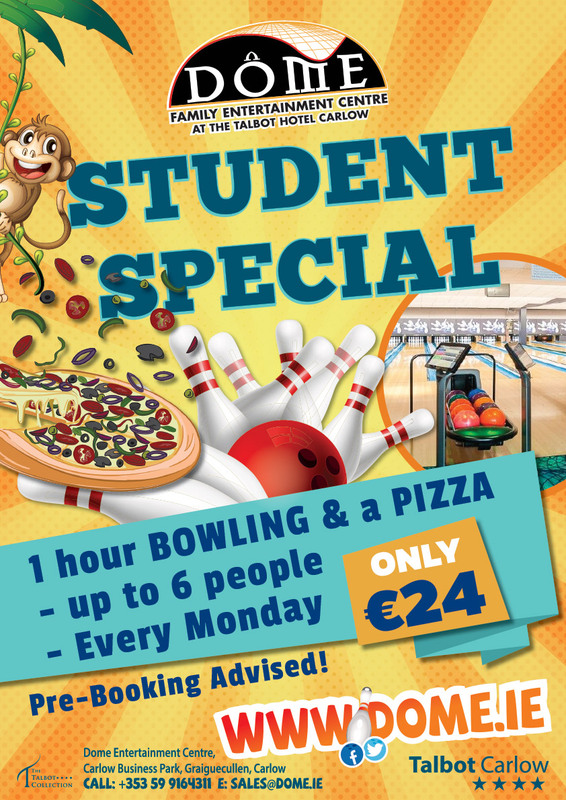 Entry is €6 and includes a complimentary tea or regular coffee & toast.  Under 5’s are €6.00 for unlimited play time. © 2017 Dome Family Entertainment Centre. 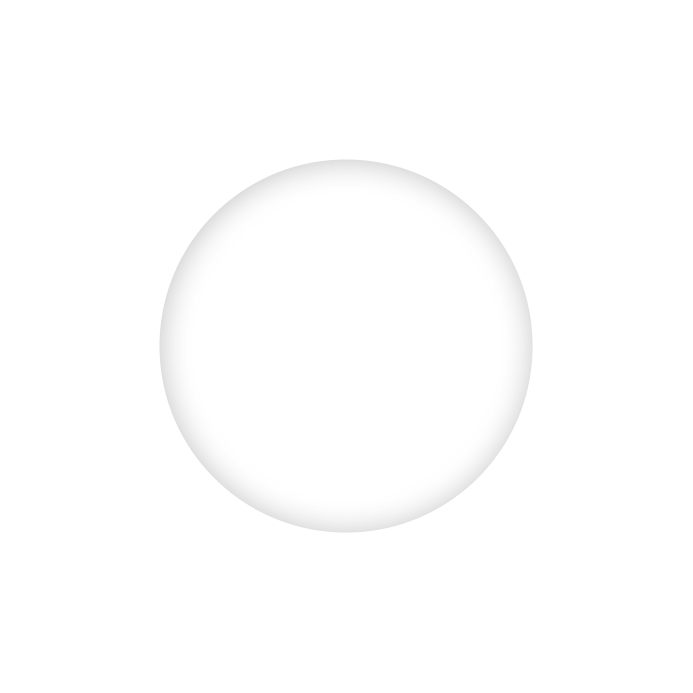 Website by Think Websites.